Hopefully you and your plants survived the heat wave. I was down at the garden on Sunday and it was looking remarkably good considering last week. I hear there were ten people down there Tuesday evening giving everything a good soaking, I'm sure that helped. This is where we all help get the shared garden stuff taken care of and we've got plenty going on and lots to do. Don't forget to bring something to eat and drink, sturdy shoes, gloves and a hat. 11am - Garden intro - For anyone who has joined us in the past month or who hasn't been before, Libby will do an intro to the garden that'll explain what's what, help orient you, and help you get to know a few friendly faces. If you haven't paid your membership contribution and would like to, you can do that too. 11.30am - Compost workshop - a regular monthly feature now, our compost workshops are always popular, is it the smell, the charming presenters (Shane and Thomas) or something else. Learn how it works and how to help make black gold from our green waste. 1pm - Stop and eat lunch! We're also trying to organise bit of a talk about pests and diseases and good watering practices. 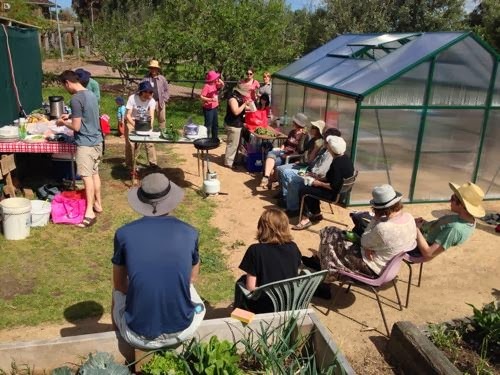 Sunday 9th Feb (same day as mid-month Communal Crew and Food Forest working bees) will see an evening family picnic/BBQ with food catered by Open Table and film screening at the garden. I know sounds great doesn't it, come along and make it amazing. Have you seen the fantastic ceramic signs (made by Sophie and some of our other gardeners) dotted around the communal beds to identify plants and let communal crew folks know what to pick? I think they give our garden a bit of character. 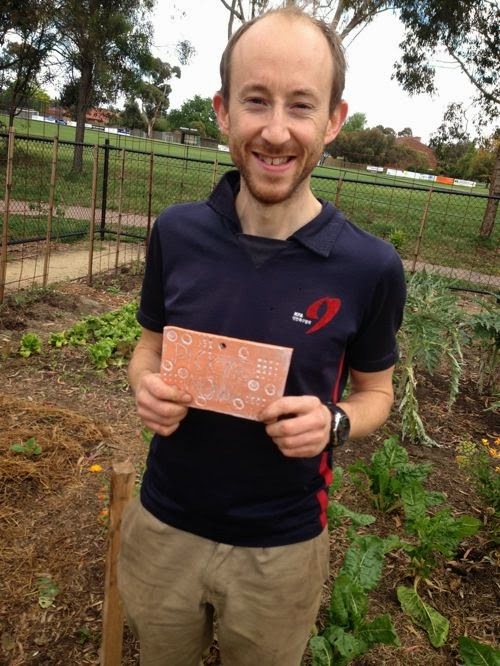 Sunday 12th saw Communal Crew and Food Forest friends enjoying a very productive mid-month session. Some welcome, fresh new faces in the food forest brought enthusiasm and energy and helped us get lots of much needed weeding and watering which I'm sure helped with the heat as well. We fixed up the shade on the greenhouse too. Our recent efforts towards a chookhouse for the garden have sadly come to nowt. Thanks again to Rosemary for being so generous and patient. One of our new communal bed "Pick me now"